To epitomize the successful and long-lasting partnership with Yas Marina Circuit, Richard Mille has created the RM 055 Yas Marina Circuit watch, a limited edition of 50 pieces exclusively for the UAE. Richard Mille is the Official Timing Partner of Yas Marina Circuit, one of the most iconic and prestigious Formula 1 tracks in the world since first hosting the Grand Prix of Abu Dhabi in 2009. To symbolise this ongoing friendship, the brand introduces an RM 055 in the colours of the track. With the flange and crown rubber decorated in Yas Blue, the highly recognisable colour of Yas Marina Circuit track, the design of the RM 055 YMC has been subtlety defined. Richard Mille pays tribute to the circuit by placing the YMC logo on the sapphire case-back. The mechanical movement of the RM 055 YMC in grade 5 titanium displays extreme skeletonization, with a PVD and Titalyt® treated baseplate and bridges. This combination provides the whole structure with optimum rigidity and excellent surface flatness and finish, essential aspects for the perfect functioning of the gear train. The caliber RMUL2 is thus capable of withstanding accelerations of over 500-G’s. The movement is equipped with a variable-inertia balance wheel, which ensures reliability in the event of impacts and during assembly and dismantling, thus improving the long-term accuracy of the timepiece. The regulator index is eliminated, and a more accurate and repeatable inertia adjustment is possible thanks to four small adjustable weights located directly on the balance wheel. The double barrel mechanism helps to improve and equalize long-term torque stability: This is achieved by dispersing the stored energy within two winding barrels, equalizing torque as well as reducing pressure and friction on the bearings and pivots, resulting in improved long-term performance. The RM 055 is assembled using several sizes of spline screws in both the case and the movement. These screws age well and provide better control of the torque applied during assembly, and are therefore unaffected by the physical manipulations involved in assembly and disassembly. The distinct construction of the RM 055’s case is designed to meet the demanding requirements of sportsmen and racing drivers. 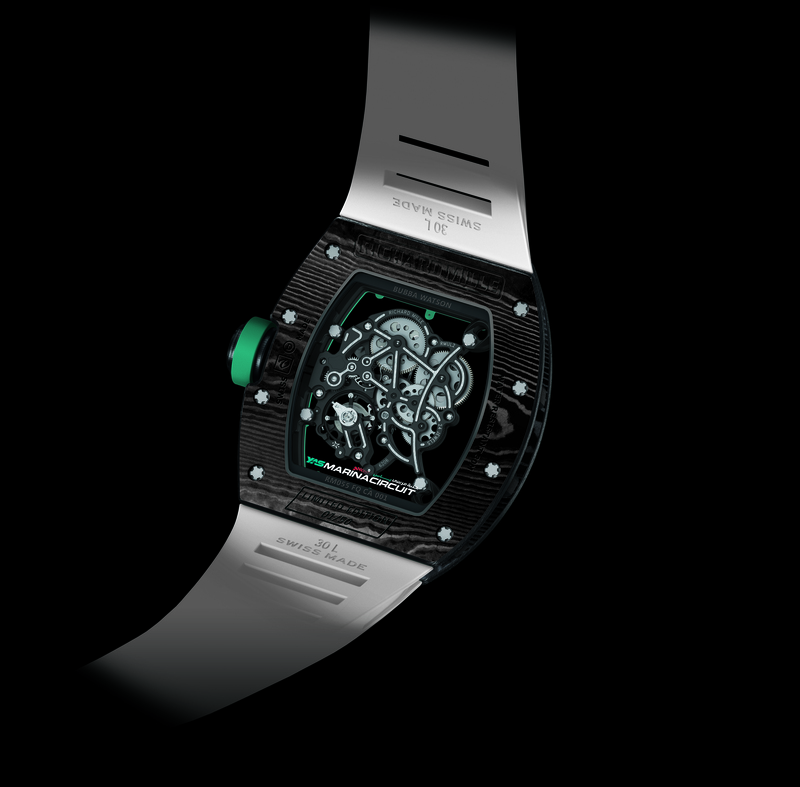 Thus, the exclusive carbon TPT® material, a signature of the Richard Mille collection has been used for the case. It consists of over 600 layers of carbon fibers, making it exceptionally rigid and highly resistant to impacts. The RM 055 YMC is a highly technical creation that is innovative, sporting and hand-finished in the finest watchmaking traditions. 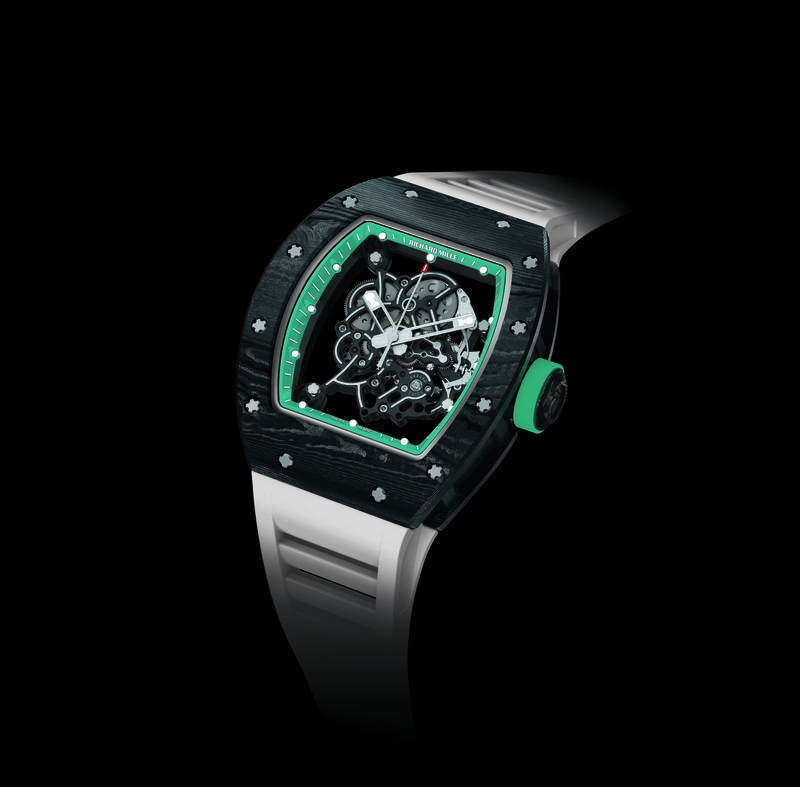 The piece is exclusively available at Richard Mille Boutiques in the Dubai Mall and Galleria Mall in Abu Dhabi.